Every month, I compile the internet's biggest list of free nonprofit webinars. Keep your 2019 momentum strong by watching a few of the free nonprofit webinars happening in February — and start growing your membership even more than before by learning about 15 tech tools that can make the process easier on February 26. Other topics this month include how to respectfully tug on donor's heart strings, how to sell out events, the best grant writing strategies, and truly involving volunteers in your cause. And now, here are all the free nonprofit webinars happening in February with times indicated in EST. This month we'll talk about the process for brainstorming and implementing new revenue streams. You're interested in starting a charity or socially conscious business, but how you'll make money worries you. If most non-profits are telling stories as a part of their fundraising and communications strategy, how can you make sure you tell stories that stand out and get results? It all comes down to the connection you form with the audience through the story you tell. And while that connection may pull at heartstrings, there are many ways to evoke this beyond stories that feature puppies and kids. There's a wide spectrum of emotion and connection your non-profit can tap into. By evoking the right emotions and values, you can make a better case for support and action. Join me for our next FREE webinar where I'll be sharing how your non-profit can improve its storytelling effectiveness in 2019. Can't make the live webinar? The recording will be available to everyone who registers. Grow your nonprofit with a next generation fundraising strategy. Mazarine Treyz, nationally recognized author, speaker and nonprofit leader will take organization executives on an inspirational journey through innovative research and proven fundraising strategy. We will look at the current state of fundraising, what is causing a giving downturn, and what we can do about it. We will cover different programs and how they are innovating in technology, earned income, partnerships and marketing, and we’ll even go over how to start your own unique partnerships and earned income streams. Can't make it? Register anyway and we will send you the recording! What is next level fundraising? You just wrapped your last campaign. When is the next time your donors will hear from you? For many nonprofits, being between campaigns means squeezing in events, visits and prospecting until it’s time to ask again. The silence donors hear after giving is a big contributor to weak retention rates. But it’s not the only problem. Without great marketing, it is difficult for donors — and prospects — to feel connected to your work. Many nonprofit communicators “inherited” marketing. Often on top of the job you expected and are actually trained to do. With everything you have to juggle, priority is often placed on the “sales” and the next deadline. Marketing, however, is a critical part of fundraising. And it’s what sets up the donor for your ask. Without marketing, every call is a cold call. In this session, Beth Brodovsky will show you what savvy nonprofit marketers do to build engagement and turn it into action. 7. Your Next Planned Gift is Just a Phone Call Away! Join Anthony R. Alonso, President of Catapult Fundraising, for this free, 45 minute webinar on soliciting planned gifts. Learn how to identify your best planned giving prospects, solicit potential donors, and close the gift over the phone. Explore methods for how to make the ask using the mass communication instruments of mail, e-mail and telephone solicitation. This webinar will also provide strategy on the selection of donors for a planned giving direct marketing campaign. Most planned giving donors say “they were simply never asked” for a gift. Learn how your organization can avoid this common pitfall and develop a thriving and profitable planned giving marketing and solicitation plan. 8. Nonprofit Insights: The 2019 Volunteer Management Progress Report Results -- Special "Tech Edition"
Wondering which volunteer management platforms are most loved by leaders of volunteers? Wondering which social media tools are used to reach volunteers and how frequently? Wondering how leaders of volunteer rate their technology competence and how you compare? We'll report answers to questions like these and more in the fourth annual Volunteer Management Progress Report. The report will reflect the results of a volunteer management "state of the Industry" survey conducted by VolunteerPro during the winter of 2018. Get the real data you need to become a better advocate for respect and resources. Come hear Tobi Johnson, President of Tobi Johnson & Associates and the Chief Engagement Officer (CEO) of VolunteerPro and Jennifer Bennett from VolunteerMatch discuss what we've learned from this report and what it means for those leading, directing and managing volunteers. Need help figuring out what government funding is available to you to hire and train staff at your nonprofit or charity? In this webinar, Mentor Works will cover the top trends in government funding and the elements organizations should be aware of when they’re considering various incentive programs. Participants will learn key tactics to develop a funding plan, as well as details on some of the top hiring and training grants available to Canadian organizations. Let’s aim for faster, easier, and more effective reporting in 2019! Nonprofits know that running data-driven campaigns is key to a successful fundraising program, yet nearly half of nonprofit professionals reported that they do not consistently utilize data as part of their decision-making process. Our experts bring with them over 20 years of experience working with nonprofit fundraisers to maximize their revenue. Join our webinar to learn more on the key metrics and reporting insights that help nonprofits raise more money and maximize their impact! 13. So You Want to Write a Grant? Presented by Grant Writing Expert Diane H. Leonard, GPC. Diane is a Grant Professional Certified (GPC) and Approved Trainer for the Grant Professionals Association. Diane and her team have secured more than $51.1 million dollars in competitive grant awards since 2006 for the clients of DH Leonard Consulting & Grant Writing Services. When not working with her team on grant applications for clients, Diane can be found in the 1000 Islands, out for a run, or drinking a strong cup of coffee. Do you have board members who are “allergic” to fundraising? Few things are more critical to your nonprofit's health, success and sustainability than an effective board of directors. If you are ready to transform your D-list to an A-list, come learn tips and tools to get board members willing to engage, share their contacts, be connected to your cause, and give of their financial resources and expertise. As a special bonus, attendees will receive Rachel's eBook "Makeover My Board! : How to Lead, Inspire or Even Fire Your Board"
Have you heard of Google’s Ad Grant program, where they give $10,000 a month in free advertising to nonprofits? Join us for a crash course on how Google Ad Grants can benefit your nonprofit by bringing thousands of new visitors to your website every month. Presenter Jason Jensen, a Google Ads Certified Consultant, will also cover how to get started, what’s necessary to be successful, and a special offer for The Digital Nonprofit’s Ad Grants management service. We’ll also include an extra long Q&A portion so no question goes unanswered. If you’ve ever wished for a silver bullet to reach thousands of supporters, grow your email list, or attract more donors, this webinar is for you! This class will provide you with step-by-step instructions on how to generate a standard project budget for a foundation proposal. Don’t let the fear of implementation hold you back from achieving more. Discover the three steps for executing a no-hassle, no-headache AMS implementation that doesn't need to be a pain in the association (PITA). This 30-minute session is filled with actionable and effective tactics for building a strategic AMS implementation plan and actually sticking to it. Our presenter, Tobi Johnson, is an internationally recognized expert and thought leader in the field of volunteer management. In this free webinar, she will share seven fundamental best practices to attract qualified supporters and keep them coming back for more. Tobi Johnson, MA, CVA is an internationally recognized author, speaker, thoughtleader in the field of volunteer engagement. She is the President of Tobi Johnson & Associates, a consultancy that helps nonprofits of all sizes strengthen their volunteer strategy, and Chief Engagement Officer of VolunteerPro, an online learning and networking community for leaders of volunteers. Join fundraising master trainer, Chad Barger, CFRE, for a discussion on the importance of donor retention and learn simple, actionable steps that you can take to boost donor retention in your organization. The psychological health of your teams is becoming increasingly important in the context of performance, retention, and cost – all things that are crucial to achieving your mission. Join the Canadian Mental Health Association to hear more about how organizations both small and large are addressing psychological health and safety. You will learn about practical, low-cost (or no-cost!) strategies you can implement quickly and that are proven to help create a culture that enables your employees to do their best and thrive at work. Event sponsors - you know you want them but aren’t quite sure how to get them. Sometimes they feel as elusive as a winning lottery ticket! Rest assured that potential event sponsors really are out there, and they actually have funds earmarked to spend on events just like yours. The reason most organizations fail in the hunt for sponsorship dollars is the lack of a rock-solid game plan for identifying, attracting and signing sponsors. Wouldn’t it be great if there was an easy-to-follow roadmap to help you create winning sponsorship strategies? Well, you’re in luck, because in this Free Live Webinar, event planning expert A.J. Steinberg is going to show you her step-by-step blueprint for identifying, attracting and signing sponsors. During this information-packed webinar, Simon Choy, founder of ConnectAd - who manages over $2M in annual Google Grants funding - will tell you everything you need to know about the program, how it can benefit your nonprofit, and the actual process of applying for the grant. Simon will also highlight a few best practices and inside tips when using Google Grants and tell you about a professional service that is proven to help nonprofits effectively maximize the value of their Ad Grant. Instructional, step-by-step details of the application process. You can find the answers, and raise more dollars, by learning a few basic principles of website analytics. Let Yesenia Sotelo of SmartCause Digital walk you through website analytics for fundraising in this information-packed training webinar specifically created for nonprofit communicators and fundraisers! So you have some monthly donors? Congratulations! But, how about those expiring credit cards? Can you do something when the donor’s payment doesn’t go through? How many times or how long should you keep ‘nudging’ monthly donors to give you their updated information? And can you bring them back after their monthly gifts stopped? You’ll learn the difference between hard and soft cancels. You’ll get answers to all these questions and more during this brand-new webinar, especially designed for those organizations who already have monthly donors. But, it’s also very worthwhile attending if you’re still in the process of starting your program, knowing what to do from the beginning stages is important. Because monthly donors are so powerful. 100 monthly donors are worth an average of $24,000 a year. They’ll give two to four times more than other donors. They’ll stay with you for at least 5 to 7 years and often even longer. They’re 7 times more likely to leave you in their will. Worth a little bit of work to keep them. In this interactive webinar you will learn the best approaches to keep your monthly donors giving for years on end, using tools you already have in place. The difference between hard and soft cancels. Different tools and approaches to help you prevent lapsing monthly donors. How to thank and cultivate monthly donors to prevent them from ever canceling to begin with. Have you found that it’s getting harder or taking longer to fill up your events? Are you sick of waiting for checks in the mail? Exhausted from processing registration forms? If you're a Wild Apricot customer, you may already be applying these strategies because our software does most of it automatically, but please join us if you feel you could learn more. We’d love to have you. Are you doing the right things to recognize the work volunteers do for your organization? Are your recognition strategies and events stuck in the past? In this webinar we'll discuss what motivates today's volunteers and discuss strategies for matching recognition to motivation. We'll also share examples and ideas to incorporate creative and meaningful recognition into your volunteer engagement strategy. Major gifts fundraising has traditionally taken place primarily face-to-face. Major gifts officers focus on building close relationships with their biggest supporters, and they spend tons of time, effort, and deliberation crafting the perfect ask. But what if we told you that online major gifts fundraising is possible... and that it's growing in popularity and that you can use it in those in-person asks to get larger donations faster? This webinar will focus on how to make major gift giving online easy and compelling! We'll give you actionable tips on how to implement online giving specifically focused on major donors, many of whom have been waiting for this option. Ready to enter a whole new world of major gifts fundraising? Project Donor Love is here to make it happen! Building a successful nonprofit begins with a passion for helping others and forming strong relationships. Join us to learn how Alan Chorun, executive director of Young Vision Africa built his nonprofit from the ground up. What started with humble beginnings grew to build a clean water system, a school, a medical clinic, and homes for families. And they have so much more planned for 2019.
Who should watch? This session is designed for any nonprofit organization wanting to engage others in the mission of the nonprofit, grow supporters and sustain the nonprofit. Join Brian Schultz, manager of the Funding Information Network at Foundation Center, to learn how the Funding Information Network program can help your nonprofit resource centre, community foundation, or library support your local nonprofit and small business economy. You'll learn about the key components of the program package, including Foundation Directory Online, grant-seeking training guides, and our upcoming certification modules. Too often organizations look at volunteer engagement as something that's nice to have, and never realize the true potential of volunteers. But, our organizations become more successful, responsive, and effective when we look at volunteers as a key component to our organization's success. In this session we'll discuss creating a connection between the work volunteers do and the mission of your organization. You'll learn how to design volunteer opportunities with real impact, and how to tell the story of that impact both within your organization and to your community. Attendees will leave with sample mission-driven position descriptions and a worksheet to help craft their organization's story of volunteer engagement. Some membership managers are able to get everything done and still have a life. How do they do it? The quick answer is that they use tech tools to do as much of their work as possible. If you want to learn how membership organizations use tech tools to automate tasks and save hours and hours each week, please join our free webinar with SEO tech expert Terry Ibele. While the world around associations continues to evolve, the essential stages of the membership lifecycle remain unchanged. Recent years have seen the introduction of multiple studies designed to help associations understand these steps in context of the different generations within their membership, highlighting what makes each unique and providing guidance on how to best meet their particular needs. Many of yesterday’s young members, the Millennials, have grown in their careers and in their understanding of the value association membership provides. Meanwhile the older members of Generation Z, generally defined as those born between 1997 and 2012, are coming into adulthood and are expected to constitute a fifth of the US workforce by 2021. What does this mean for associations and nonprofits? How young members are - and are not - engaging with the events programming critical to non-dues revenue. Membership matters. While each organization’s membership is unique, these findings can inform and support strategies designed to support the long-term growth and success of your organization. A special welcome to new or aspiring executive directors, executive level nonprofit professionals and board chairs or any nonprofit management enthusiast. Join Anthony R. Alonso, President of Catapult Fundraising, for a FREE, 45 minute webinar that will explore ways to integrate all forms of direct marketing into your Annual Fund program. Discover techniques to incorporate direct mail, e-mail, telephone solicitation, social media channels, and other forms of digital media content into your case for support and solicitation efforts. This session will look at current statistics and what these numbers really mean for your organization and for your team’s development efforts. Develop a strategy for capitalizing on your social media platforms and how to make the most out of your email, text message, and telephone solicitation efforts for your non-profit. Have you ever wondered what it might be like to start your own consulting business? Or if you have given this career a try, are you itching to see how your peers get through the early stages? From marketing, to setting up shop, to setting fees, join two veteran consultants as they present a fast-paced session around the most common questions asked by new consultants and the honest answers you have craved. Plus, in case your burning question isn’t among the five, there will be plenty of time for you to get your question answered. Susan Schaefer and Don Tebbe have led workshops for new consultants around the country. During this power hour, they consolidate the thousands of questions asked of them over the years to the five most frequent and impactful. If you have ever considered how to get started in this career path, this webinar will help you ease your way into a successful career supporting the nonprofit sector. How is resilience defined at your nonprofit? When faced with economic shifts, political challenges, and demographic changes, would you rise above? In this webinar, industry leaders will reveal how they recovered from setbacks, adapted to change, and kept their organization going in the face of adversity. Let's get back on track and plan the communications for next few months together. What do you want out of your communications? Do you want to communicate an anniversary? Is it getting more donors? Keeping your donors? What do you think might be holding you back? How can we take a couple small steps in the next couple hours to get closer to our goals? Let's get clear on our communications goals and go for them! We'll go right into helping an organization in this webinar, so you can see how easy it can be, right there, to make your communications plan. And each person who comes will have access to the free xls comms plan to start making your comms plan then and there. Do you sometimes feel that your membership is like a leaky boat? Every time you look at your database, you notice a few members have left? Quickly identify who is about to leave, and what you can do to keep them. And that's it, folks! 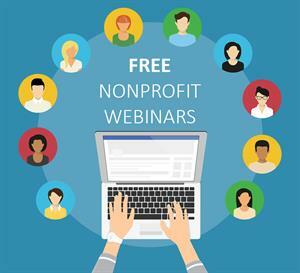 If you know of any other free nonprofit webinars happening in February, please email artie [at] wildapricot.com and I'll add them to the list.